We've been wanting to make Moon Sand for a while and we finally did. 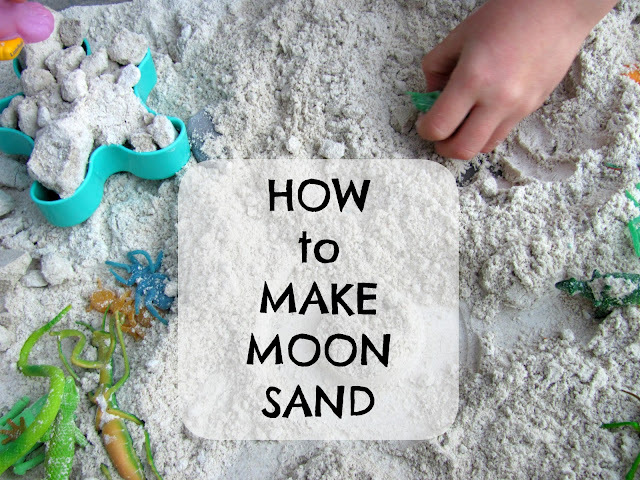 Making Moon Sand is a great way to rediscover your play sand. We mixed all the ingredients in a big plastic tub. We added a little more water and each day it was played with it more water was added. It was fun to make. 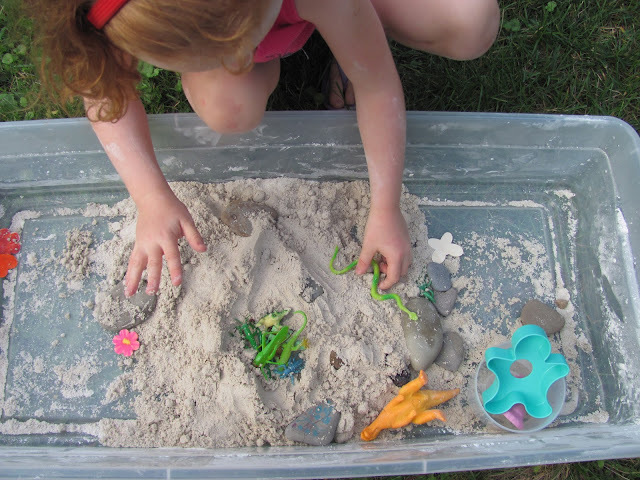 It was fun to add plastic creatures and rocks to the Moon Sand. It had a nice texture that my daughter enjoyed. A great new sensory experience. Moon sand formed into little rock shapes very easily. I think it is called "Moon Sand" because of this quality. We will need to get some toy aliens, astronauts, and space ships to add to the fun. It is always enjoyable to make something new with things you already have on hand. Moon Sand is definitely one of those experiences. Hope you have fun making Moon Sand! Sure. Can't wait to see your version of it! We made a moon sand and neither of us enjoyed it for long - as you mentioned, it sort of hard to keep it at the right consistency - it's either too "rocky" or too soft. And then it's a pain to get rid of. But I thought the idea of trying a moon sand on a beach and thought that it's brilliant, because clean up is easier. Maybe next time we'll try that. My daughter did enjoy it and has revisited it many times since we have made it. It kind of reminds of "cloud dough" because it never holds it shape permanently. (which makes it kind of cool) We kept it outside, but I don't think we would keep it in the and box because it has corn starch in it.